In response to a previous posting showing Elvis Presley inside a phone booth, a reader (Erin) sent me a photo she had found of Elvis deep in conversation on a Vintage Rotary Phone. I promised Erin that I would post the picture. Since today would have been Elvis’ 74th birthday, what better day to publish his photo? It looks like a Western Electric Model 500. Happy Birthday Elvis, wherever you are celebrating. Elvis gets his second featured posting in just the last four postings. Looks like I need to get to work and get some more posts written! By the way Erin, THANKYOUVURYMUCH! I received an e-mail from a fellow telephone collector, Jonathan Sowers after he read this posting. Jonathan did some searching on the internet and found yet another photo of Elvis talking on a Vintage Rotary Phone. In the photo Elvis is talking an a Mediterranean Blue Model 500. The phone has a neutral gray coiled cord. 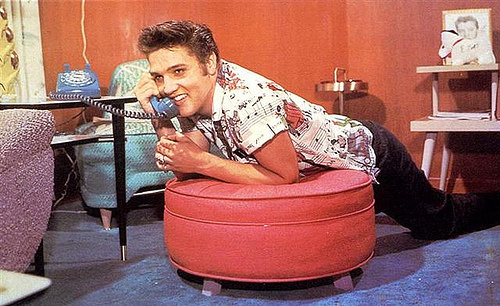 Also as Jonathan pointed out Elvis is wearing the same shirt in both the photo with the blue phone and also in the photo originally posted here with the red phone. There is a portrait of Elvis on the desk and it actually appears that the photos make have been taken at Elvis’ home. We know that the photo at the top of this posting is from 1956 and as Jonathan pointed out Elvis’s first movie was released that year. “Love Me Tender” was a western so it is unlikely these photos would be from a movie set. Nonetheless, thank you Jonathan for find this photo on the web and forwarding it to me. 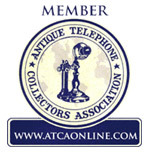 By the way the Mediterranean Blue Western Electric Model 500 (and the 554 wall version) was only produced by Western Electric beginning in 1954 and the model was discontinued in 1957. One more note about these photos. 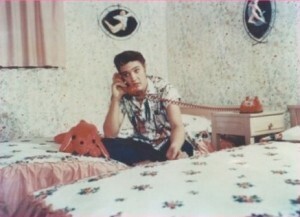 The small photo of Elvis, above on the red phone is a reversal of the larger image. 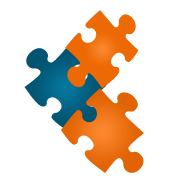 Jonathan took the time to use Photoshop to reverse the image and reported that it lay perfectly atop the other. Yes, but can you give us more details about that particular phone Elvis is talking on? Let’s see…..it’s red, it appears to have a hard wired cord, the dial card in the center of the finger wheel appears to be a matching color, the foot pads appear to be suede covered. (Actually I’m just guessing on that one). But I was able to locate an image that appears to have been taken at the same time and was dated 1956. I have added that close-up shot to the posting. Thanks David for pushing me to do my homework. You are indeed the expert. And he’s apparently calling from the bedroom of his maiden aunts? Or perhaps a pair of teenage girls? Interesting photo.